Arches National Park, Utah, with an apocalyptic feel. Expired Kodak medium format slide film with Photoshop treatment. Like a Stargate. A beautiful composition with great treatment. I love it. I like the optical illusion here. Great image and perspective. What a great find! Love how you've captured this. Gorgeous composition and post processing. ditto frida's observation.. it seems out of this world.. 🙂 beautiful capture.. Excellent pgotograph, great composition and processing! Great photograph & nice post processing ! I always wonder why they haven't fallen over so many years. A strangeness perfectly enhanced by the processing. Great job! 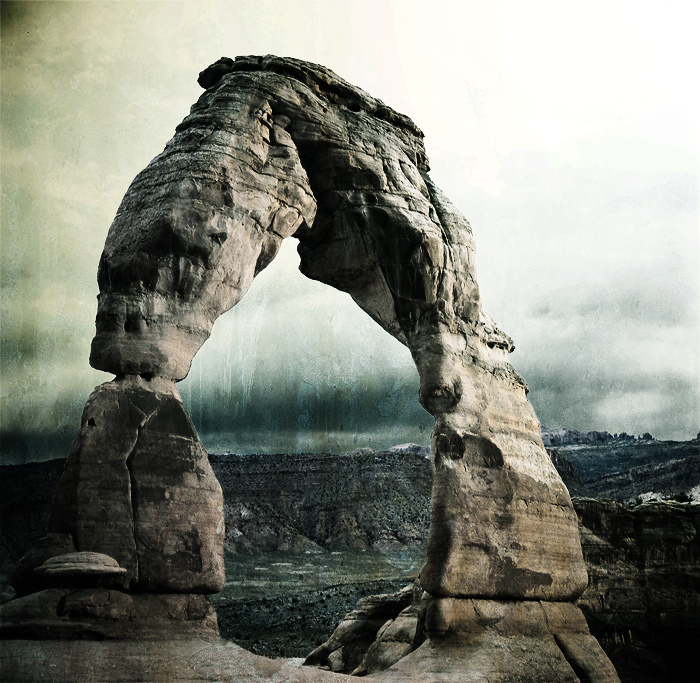 This is the most interesting Delicate Arch image I've seen. I like it a lot. i love your use of textures shown on this photo. beautiful! Beautiful image. Superbly edited. Well done. Seems several people I know are going back to using film. This turned out very well – excellent processing of a very cool subject. Really amazing arch!! You cant beat that grain! Wonderful art. I love the toning and great composition. W o w, dream view and fantastic processing. What an amazing image! I looks like a landscape out of another world. Tones and textures are excellent! Nice motiv and a good processing. Very impressive processing and composition ! Superb !